September 17, 1862, was the bloodiest day in American military history. The Battle of Sharpsburg (also known as the Battle of Antietam), fought in Maryland near Antietam Creek, resulted in over 23,000 casualties. 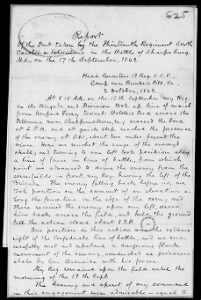 Accounts of the battle, written by Southern officers, can be found in the Confederate Casualty Reports on Fold3. Reports typically contain narratives of unit activities in battle, followed by lists of casualties: the dead, the wounded, the missing, and those taken prisoner. Beginning with the report of Col. O.E. Edwards of the 13th South Carolina Infantry, and ending with the casualty list written by Capt. W.T. Poague of the Rockbridge (Virginia) Artillery, five official reports offer first-hand accounts of the Battle of Sharpsburg, also known as the Battle of Antietam. Col. Edwards wrote how his men took position “along a fence-line on the edge of the corn; and there received the enemy upon our left, drove him back across the field, and held the ground till the action closed at 8 P.M.” He lost one man and fifteen were wounded. 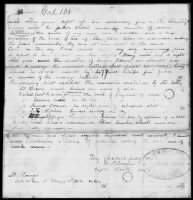 The Confederate Casualty Reports bring a unique perspective of military engagements in the Civil War. They are arranged by state, then by battle. Some reports include insights by Fold3 members, providing additional context or history. For example, with the Meredian Expedition, a comment about Forrest’s Cavalry explains that the 7th Tennessee Cavalry was also known as Duckworth’s Cavalry, commanded by Colonel Leonidas Duckworth. From Chickamauga to Gettysburg, Vicksburg to Fredericksburg, these records include soldiers’ names, battle strategies, tributes to the troops, Indian encounters, and scouting reports. Access the Confederate Casualty Reports for more details.